On Friday I nipped down to Freemason's Hall in Holborn to take a look at Fashion Scout's Ones to Watch showcase for CUB Magazine. Not quite as glamourous as the bigger shows, but nevertheless interesting to watch. I wrote little summaries for each of the designers showcasing for the online section of the magazine (where there's also show reports on the rest of LFW, too). George Styler: Styler's multicultural influences were obvious in what was (judging by the audience's applause) the most successfully received showcase. The only show to feature designs for men and women, all of the models wore headpieces made out of plaited hair, reminiscent of Heidi braids, but with added tassels, sequins and adornment. Applique, pom poms, wool, sequins and embroidery covered his designs; unabashedly clashing patterns and contrasting textures abounded. A particular highlight were the heavy knits, showing Styler's expertise in knitwear design and inspiration taken from the traditional embroidery in many cultures. Sarah Ryan: A break from the colourful offerings of the other three designers, Ryan's collection of black and muted tones was by no means boring. Having previously worked with Gareth Pugh, Ryan seems to have taken inspiration from his modern gothic aesthetic, weaving leather into clothing that almost resembled harnesses. 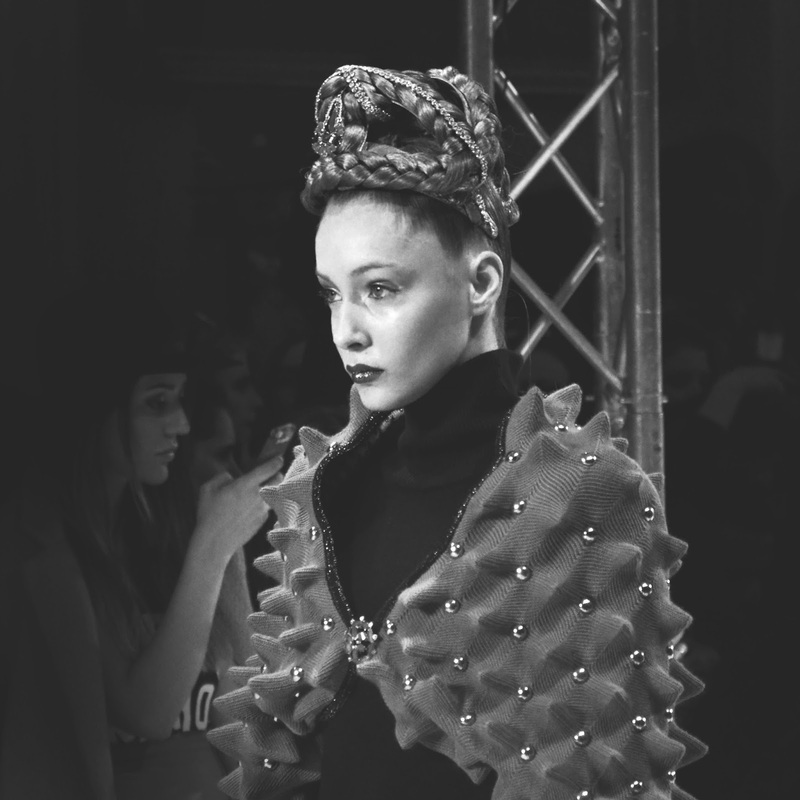 Textures kept the mainly black collection varied and interesting, with the skill of the design taking centre stage. A testament to Ryan's penchant for playing with scale and form, the collection also featured giant bags, often dwarfing the models themselves: some even appeared to have rose-like forms woven into them, as if a bunch of flowers were peeking out of the top. Carrie-Ann Stein: Inspired by working-class culture, London-based Central St Martins graduate Carrie-Ann Stein brought out a collection full of fun and humour. The oversized and unusual silhouette of her graduate collection remained - huge, square cut shoulders fitted with large eyelets and a trapeze shape ruled the collection - but this time interspersed with sleek, sporty pieces. All the garments retain Stein's idiosyncratic use of bright colour and offbeat patterns, featuring shop signage, street images and textures. This collection showcases Stein's development as a designer, taking her designs from sculptural pieces to wearable items. Hiroko Nakajima: Knitwear label Hiroko Nakajima showcased a collection typical of their focus on colour and graphics. Bold, bright colours were interspersed with monochrome pattern in a luxurious array of sleek dresses, skirts and jumpers with new details such as flared cuffs, capes and slightly too-tall beanies - topped off with chunky clutch bags and sleek plaits for the models.